I came upon it in the book 'Lal Qila ki ek Jhalak', written by Syed Nasir Nazir. One of my favourite PG Wodehouse novels is Damsel in Distress. Wodehouse's heroines were usually grande dames who could evoke fear in many a male breast. "Damsel in distress" is a popular way of portraying women - as helpless creatures without any resources to protect themselves, who need men in their lives to keep themselves safe. From my readings of history, I have found this trope to be inauthentic; women were indeed quite resourceful — they had to be, for the men were often out on campaigns and kept busy by trade. I came upon a book titled Lal Qila ki ek Jhalak by Syed Nasir Nazir. Nazir was born in Delhi on August 16, 1865. His early education was under the tutelage of his father, a noted poet with the pen name "Malaal". The latter were also very brave — ready to fight back, blow for blow. Inclined towards pursuing medicine since childhood, Nazir made a name for himself as a physician. The Rais of Dharmpur appointed him as a tutor for his children, and as a physician for himself. After the death of Rais of Dharmpur, he came to Delhi. Here, he found himself drawn to spirituality and led a life of seclusion. He wrote a series of articles for the magazine Saqi, later published as Lal Qila ki ek Jhalak. In the book, he describes events inside the palace, as heard from Banni Khanum, the daughter-in-law of the female daroga or superintendent of the palace kitchens. She had accompanied her mother-in-law to the palace and remained connected to the royal kitchen till 1857. Nazir chronicled her memoir in the shape of 76 stories. One appealed to me personally because as a young girl, my maternal grandmother had also once foiled an attack on her house by dacoits by pretending to smoke the huqqah loudly and making growling noises. The dacoits, who had decided to loot the house thinking no man was present inside, fled — thinking the men of the house have returned. I used to love listening to this story as a child. There were two important centres of Naqshbandi Sufi saints in Delhi's Shahjahanabad. One was the khanqah or hospice of Mirza Jan e Janan and the other the baradari of Khwaja Mir Dard. I was a follower of the latter's maternal grandson. Because of these saints, all of Turkomania seemed to have come into Shahjahanabad. Hundreds of their followers lived inside the city — in fact, one locality of Sabzi Mandi had been named Mughalpura after them. They were very brave warriors and had joined the royal army, showing their prowess in the Deccan campaigns. When Shirin Beg and Shakkar Beg came prancing upon their houses from Lahori Darwaza till Chandni Chowk, they would always come to blows with the people of Dilli. The latter were also very brave — ready to fight back, blow for blow. People from both sides would be left wounded, but no one would ever complain to the police. One day, when I came to the baradari to pay my respects to my spiritual master, I saw around 50 women and children from Mughalpura had assembled there. I asked Imami Begum Sahib, the granddaughter of Mir Dard and wife of Maulvi Nasir Jan, "Hazrat why have so many of these Mughalpura women come here today as there's no urs (birth anniversary of the saint) or wedding?" Begum Sahib said, "They are beset with problems and so have left their homes in fear and come here. Khanum, you know their men, from age 12 till 50, have accompanied the emperor in his Deccan campaign? These women and their small children were left alone at home. Some eight days ago, a beggar came to their door, asking for alms. One of the women told her servant to give some flour to the beggar. The beggar listened to her intently before moving on, continuing his chant for alms. When the servant returned, the women asked her what had taken her so long — what had she been telling the beggar? She recounted her conversation with the beggar, and the women were furious with her for telling a stranger that there were no men in the homes to guard them. They were scared that the beggar would plan a robbery and loot their houses at night, and even ravage them. Their houses have windows, which open into one another's and soon, this disturbing news reached everyone. The women got together and held a conclave on the best way forward. At night, they dressed in men's clothes, picked up their husband's weapons and climbed on top of the roofs of their houses. The night passed peacefully. The next day, the beggar came again, calling out for alms. The servant ran out upon hearing his voice. The same day, the Mughal women came here with all their valuables and money. 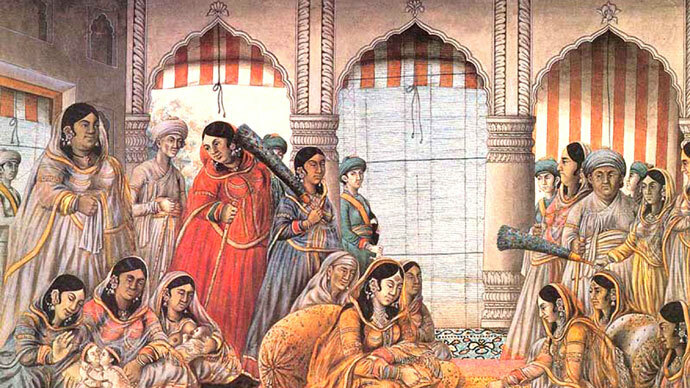 The Mughal women were very amused by the news of the beating the servant had received. Now, Hazrat Baba has written to the police, who have promised to provide them security. These women will return to their houses in a few days." The writer is the author of 'Where Stones Speak' and other books.